The latest market report published by Credence Research, Inc. “Europe Offshore Wind Energy Market, By Geography- Growth, Future Prospects and Competitive Analysis, 2016 - 2024,” the Europe offshore wind energy market was 13.4 GW in 2016, and is expected to reach 29.8 GW by 2024, expanding at a CAGR of 12.0% from 2016 to 2024. 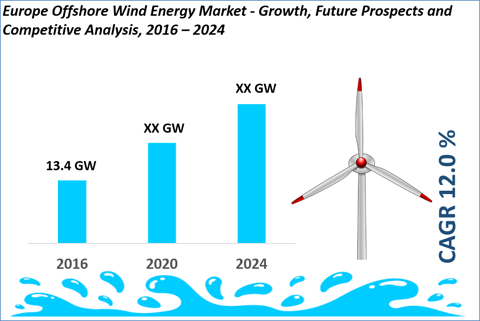 Europe offshore wind energy market is projected to witness robust growth owing to increasing investment in offshore wind energy projects. Rising energy demand and growing concerns over the emission of greenhouse gases is influencing the governments to promote the adoption renewable energy source such as wind and solar. Increasing investment in the offshore wind projects especially in Europe is anticipated to fuel the growth of offshore wind energy market. However, high cost of installation, delayed regulatory approvals and stringent labour laws are factors expected to restraint the growth of Europe offshore wind energy market during the forecast period (2016-2024). U.K. was the largest market for offshore wind energy in 2015 among all European countries. Increasing investment in offshore wind energy projects from private sector coupled with favorable government policies such as Energy Act, 2013 and establishment of Offshore Wind Cost Reduction Task Force to achieve levelised costs of offshore wind to £100 per MW/h by 2020 represent high growth for the offshore wind energy market during the forecast period (2016-2024). Germany is projected to be the fastest growing segment among all European countries during the forecast period. High number of approved and pipeline projects coupled with increasing investment from private sector in offshore wind energy is anticipated to fuel the growth of offshore wind energy in the region. The country is anticipated to witness addition of 4.5 GW capacity of installation offshore wind energy from under construction projects in next five years. Further, approval of new projects and pipeline projects is projected to expand the installation capacity to 9.4 GW by 2020. The country also holds second largest market share on terms of installation capacity in Europe. The country is projected to gain significant market share by 2023. Other regions such as Denmark and Netherlands are also anticipated to witness high growth during the forecast period (2016-2024). Considering the competition, the Europe offshore wind energy market is expected to witness a significant rise in investment in research and development with the focus to reduce installation cost of offshore wind installations. Further, market has witnessed strategic mergers and collaborations among Europe offshore wind energy regional and global players. Such growth strategies are focused on increasing their market penetration in consuming economies. Next entry Base Oil Market – What Factors will drive the Market in Upcoming Years and How it is Going to Impact on Global Industry The report covers outlook and research for the Base Oil market on a worldwide and regional level.